Last week we discussed some of the letters and non-importation agreements that met the Townshend Acts. This week, the fighting gets a little more street level as Britain attempts to enforce its laws on the colonies. The creation of the new Board had been the result of the Commissioner of Customs Act that I described back in Episode 26. It was the Townshend Act that was designed to enforce trade and tariff laws in the North American colonies. Before this Board existed, most customs offices did their work in London. Top customs officials did not visit the colonies. Revenue from the colonies, even if enforced would only have been a small fraction of overall revenues. So officials in London did not really care if they squeezed another few thousand pounds out of the colonies through more strict enforcement. They were focused on the much larger duties collected in London and other towns in Britain. The new Board would have its sole focus on the American colonies. As intended, their job performance would be graded solely on revenue and enforcement in the colonies. The necessary part of this change also meant that Commissioners would have to be in the colonies dealing with the colonists face to face. One of the new Commissioners arriving that day, Boston native Charles Paxton, took the Pope’s Day threats seriously. The Stamp Act Mobs had targeted his home two years earlier. Paxton had worked as a low level customs official beginning back in the 1730s. 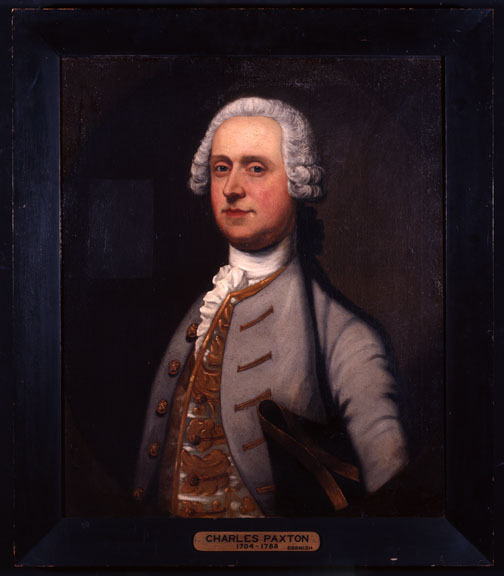 Having been Surveyor of Customs in Boston beginning in 1752, Paxton was a target for tariff protesters throughout this whole era. Paxton had moved to London in 1766, though it is not clear why. He was there in time to lobby for a position for himself on the new Customs Board. Many historians also believe he may have encouraged London to place the new customs board in Boston, rather than a more centrally located port such as Philadelphia. Bostonians seemed to take the decision to locate in Boston as a deliberate challenge to control of the city and its trade. John Robinson from Newport also sat on the new Board. Recall, John Robinson also had considerable experience in the colonies as a customs official. His attempts to impound the Polly two and a half years earlier for evading tariffs had landed him in jail for a few days and left him with threat of physical violence. Like Paxton, Robinson understood that this was not an easy assignment. Two of the other three Commissioners, Henry Hulton and William Burch were both officials from the London Board of customs who had no experience in America. The fifth member, John Temple, had been Lt. Governor of New Hampshire and also a Surveyor of Customs. He apparently had a hostile relationship with Gov. Bernard even long before this appointment. But other than that, I’ve found little about his life in the colonies. He seemed to keep a low profile. In general the Board consisted of men who were either very low aristocracy or prominent commoners who needed a good government office to support themselves, and all had already served lengthy careers in customs enforcement. Although Commissioner pay was only half that of the £1000 per year that London Customs Commissioner received, it was a good income with the potential of being promoted back to London if they did well in this assignment. The Commissioners also had authority to hire staff and agents to do the actual work of customs enforcement. Many of these hires came from the old customs agents already working for existing authorities who were now turning over authority to the new Commission. Within two weeks, the Board had set up its headquarters, organized its staff and began collecting customs duties on November 20th. Four of the five members were present. John Robinson would not return to Boston until the end of January. The Customs Board enforced both old and new customs laws with an unprecedented level of diligence. But the townspeople did not make enforcement easy. At first, Bostonians simply gave commissioners the cold shoulder. The Boston Town Meeting voted that the Governor he could not use Faneuil Hall for an annual election day dinner if he invited the Commissioners. John Hancock, a prominent merchant also objected. As head of the Company of Cadets, he refused to attend a dinner if the Commissioners were invited. The Company of Cadets was an honorary group of prominent members of the Boston establishment. They served as an honor guard for the Governor. When Gov. Bernard told him his attendance was mandatory, Hancock and most of the rest of the Company immediately resigned. Locals threatened customs officials. Ship’s crews regularly manhandled, detained, or otherwise prevented customs agents from searching ships and enforcing the law. On March 19, the anniversary of the Stamp Tax repeal, Bostonians hanged effigies of Paxton and the new Inspector General John Williams on the Liberty Tree. Officials heard rumors that protesters intended to destroy the homes of Board members. A few houses were surrounded by ruffians screaming like Indians and throwing rocks through windows, but that is as far as it went. The harassment mostly seemed to be in the form of threats and social isolation, without resorting to physical attack. More importantly though, low level officials were physically prevented from boarding ships and doing their jobs. Remember, Boston had no police force at this time, and relied on the citizenry to form posses when necessary to enforce the law. There was no way a citizen posse would back up the customs officials. By February 1768, the Customs Board was already writing letters requesting military backup to enforce the trade laws. The naval commander in Halifax deployed three ships. The largest, a 50 gun Man-of-War named the HMS Romney, arrived in Boston in May. Despite the naval presence, Bostonians were determined to resist enforcement. One of the more prominent leaders of the resistance was a merchant named John Hancock, one of the wealthiest men in Boston. John Hancock is another one of those famous names that everyone knows, primarily for singing his name in large letters on the Declaration of Independence, while President of the Continental Congress. Now is probably a good time to talk about how he got there. Hancock was born in Braintree, Massachusetts in 1737 to the local minister and his wife. A minister’s income was well above the wages of a common laborer, but still quite low by other standards. No one would have considered the Hancock family rich. But as a young adult, John quickly became one of the richest men in the colony the old fashioned way, inheriting money from other relatives. John’s father died when he was only seven years old. His mother was unable to support the family. A year later in 1745, it was decided that John would go to live with his Uncle Thomas Hancock in Boston. Thomas was a highly successful merchant. Living there allowed John to attend Boston Latin School and then Harvard. John also learned the trade of merchant, starting out as a clerk in his uncle’s office. In 1760, he went to London for a year a representative of his uncle’s firm. A couple of years after returning to Boston his uncle made him became a partner in the business. A year after that, in 1764, Hancock’s uncle suddenly died, leaving him sole owner of one of the largest trading companies in America at the age of 27. His new wealth brought him to prominence in Massachusetts. We was involved in numerous community societies and meetings. He had joined the Freemasons as well. The same year Hancock took over his uncle’s business, Parliament passed the Sugar Act. The following year, it passed the Stamp Act. Hancock took a prominent role in the protests of these new laws. He started hanging out with other Boston radicals like James Otis, Samuel Adams, and Joseph Warren. In 1765, Hancock won a seat a Boston selectman. A year later in 1766, Hancock was elected to the Massachusetts General Court, which was the colonial legislature. But while he had developed relationships with Boston radicals, and shared their opposition to the Stamp Act, Hancock did not support the Stamp Act Riots. As one of the largest landowners in Boston, he had good reason to avoid advocating mobs which could destroy the property of those with home they disagreed. He even supported the arrest of Ebenezer Macintosh, the alleged leader of the riots, though officials had to release Macintosh after it became clear a mob would release him by force if they did not. Despite concerns over the riots, Hancock used his London contacts to protest the Stamp Act, and supported the non-importation agreements. Although it appears that Hancock stocked up on items before the agreements went into effect, and profited handsomely from the sale of those stocks during the time no one could import new goods. Hancock also provided funds to Samuel Adams to help finance the protest movements. It probably made sense that he would want to remain on the good side of the man who could possibly direct future riots. But it appears Hancock generally shared Adams’ opposition to British policies as well. Hancock also made a fortune through smuggling. All successful merchants evaded tariffs and often traded with other countries in violation of trade laws. That was a good reason why Hancock opposed those laws and their strict enforcement. Like many other merchants, he also refused to allow any customs agents to search his ships, using force when necessary. Hancock had become one of the most prominent merchants resisting the authorities, as well as a well known political opponent of British policies. As a result, he was the biggest target when the new Customs Board wanted to make an example of someone. Hancock’s ship Liberty, arrived in harbor at dusk in May 1768, about a week before the Navy arrived with the Romney. The evening arrival probably was not by chance. By arriving then, the Captain knew that his ship would not be inspected until the following morning. Until then, the ship would be under the watch of only a few tidesmen, low level customs officials who worked in the harbor enforcing the customs laws. That evening, the captain of the Liberty asked Thomas Kirk, one of the tidesmen on duty, to look the other way while they unloaded the ship. The other Tidesman on duty that night was either asleep or drunk depending on whose account you believe. When Kirk refused to take a bribe and look the other way, the ship’s crew locked him below decks. He remained locked up for hours while he heard people above apparently removing freight from the ship. The Captain then released Kirk after threatening him not to talk about the incident. The Captain declared a small amount of wine, but the everyone knew the ship was capable of carrying a far larger cargo than what was declared. For about a month, Kirk said nothing. Eventually though, he informed Customs Collector Joseph Harrison about what had happened. Harrison, eager to make an example of Hancock, instructed Kirk to sign an affidavit regarding his treatment aboard the Liberty. Kirk did so on June 9th. The next day, June 10th, Harrison, along with his son who worked as a customs clerk, and Benjamin Hallowell, Comptroller of the Port of Boston, seized the Liberty for failing to declare all of its cargo. The men personally walked down to the dock and had a crew from the Romney take possession of the ship. As often happened in such cases, a mob quickly began to gather to protest the seizure. They threw rocks as a boarding crew from the Romney then cut the mooring ropes of the Liberty and towed the ship out into the harbor, where the mob could not retake her. At the ship’s removal, the mob grew incensed. They attacked and assaulted Hallowell and the Harrisons. They bloodied the men with clubs and stones, ripped off most of their clothes and beat them savagely. The mob also attacked another customs inspector, Thomas Irwin, who had nothing to do with the seizure, but happened to be at the wrong place at the wrong time. The officials, after some time, were able to escape to the protection of the Romney. Some accounts say mob of two or three thousand took part, others say it was more like five hundred. Whatever the actual number, the mob went unopposed. The sheriff could not raise a posse and the guns of the Romney could not pacify a mob on land. The crowd then attacked the homes of Harrison, Hallowell, and Inspector General John Williams, not a complete ransacking like we saw during the Stamp Acts, but rocks through the windows, that sort of thing. They attacked the homes, but once assured that the men were not there, they moved on to other targets. The crowd also found a boat owned by Harrison which they carried up to the Commons and burned. The mobs raged all day and into the evening before finally retiring for the night. Seeking to reduce tensions, the Commissioners offered to return Hancock’s ship on the promise that he would make it available when the matter came to trial. That meant he could continue to use it for the many months it might take for a hearing. Initially, Hancock agreed. However, Samuel Adams and others convinced him not to take back his ship. It would look like he was willing to work with the Commission. In the end, the ship remained with the navy until trial. The Colony’s Attorney General prosecuted Hancock for smuggling many months later, in October. The Admiralty Court heard the case. Hancock hired John Adams to defend him. The only evidence was the single informant, Kirk, who had been the basis for the seizure. Kirk, had been locked below deck and never saw the ship’s cargo, who removed anything from the ship, or what was removed. The case lingered for another five months as the prosecution tried to make an indictment that could go to trial. Given the limited evidence though, the prosecution eventually dropped its case. Hancock never got back his ship though. The Customs Board had it condemned and completed a forfeiture of the Liberty. They could not prove the Hancock had smuggled in undeclared wine. However, when they seized the ship, it was full of barrels of oil and tar, for which Hancock had not posted a bond, nor obtained a permit to load. This was really a technical violation since even merchants who intended to post bond and get permits often loaded their ships before doing so. But a technical violation is still a violation. The Admiralty Court found the ship in violation of trade laws. The ship and its cargo were forfeited. Following normal practice, the Court ordered the Liberty sold at auction. No one, however, would buy it at auction for fear of incurring the wrath of the mob. The Customs Board turned over the ship to the Royal Navy, put to work searching out more smugglers as the HMS Liberty. A couple of years later, in July 1769, after bringing two seized ships into Newport, a local mob boarded the Liberty, forced off the crew, then scuttled and burned the ship. Prosecutors also attempted to indict rioters who participated in the Liberty Riots. That went nowhere though, as those cases would be tried in civilian courts. Massachusetts elected grand jurors at town meetings. So the grand jury was made up of people who were at least sympathetic to the rioters. Some may have been rioters themselves. To give you some idea, one of the grand jurors was Daniel Malcom, the same guy who threatened to kill customs officials who wanted to look in his basement, back in Episode 25. Given how biased the grand jury was, no one wanted to come forward as a witness for the prosecution. Even customs officials or victims of the riots saw no point in making themselves bigger targets for the Sons of Liberty by testifying before a grand jury that would never indict anyone anyway. To Gov. Bernard’s great frustration, the prosecution attempts came to nothing. The Sons of Liberty used the incident to strengthen colonial resolves to enforce non-importation agreements. 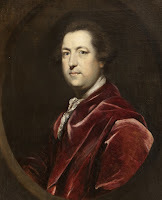 Given the fact that there was no prosecutable evidence of illegal activity at the time officials seized the Liberty, the patriots published stories focusing on royal officials persecuting a merchant mostly because they disagreed with his political views. They had seized his property without justification and kept it on a technicality that could have been used against just about every merchant in the colonies. Adams drafted a petition approved by the legislature, calling on Gov. Bernard to expel the Customs Board from Boston permanently. For the time being at least, the Commissioners were not able to do much of anything. They dared not return to Boston for fear of attack. The riot also effectively prevented the Customs Board from operating at all until the arrival of soldiers several months later. They remained aboard the Romney for some time. Later, they and their families would stay at Castle William. They would remain on that island out in the harbor for months under the protection of the British Navy. Finally, seizure of the Liberty helped solidify John Hancock’s position as a leader of Boston’s opposition movement. Hancock’s reputation as a hero of colonial resistance to the unfair trade laws only grew as a result of the trial. In the next election, his constituents returned him to office with even more vote than Samuel Adams. Next week: London officials, sick of letting Boston mobs control the colony, send British regulars to occupy Boston and subdue the rebellious colonists. Castle Island 350, 1980 (a short pamphlet describing Castle Island). Carp, Benjamin L. Rebels Rising: Cities and the American Revolution, Oxford: Oxford University Press, 2007. Dickerson, Oliver M. The Navigation Acts and the American Revolution, Philadelphia: University of Pennsylvania Press, 1951. Reid, John P. In a Rebellious Spirit: The Argument of Facts, the Liberty Riot, and the Coming of the American Revolution, University Park: Pennsylvania State University Press, 1979. Last week we looked at colonial concerns over the Townshend Acts, as the British government, appointed government ministers increasingly hostile to colonial views. The colonists still did not not really have a principled rationale on which to make a stand against the taxes. They did not want to pay the taxes and were concerned about them becoming more onerous. Arguing, though, that they just didn’t want to pay money did not seem particularly effective. The Townshend Acts took effect in November 1767. Colonial response initially seemed to be grudging acceptance, or at least an inability to agree on how to protest the new Acts. This week, one man finds a way to rally public opinion against the new laws. In December 1767, an anonymous letter appeared in the Pennsylvania Gazette signed simply “A Farmer.” For the next twelve weeks, the "farmer" would write a new letter each week. All twelve letters criticized various aspects of the Townshend Acts and called upon the colonists to act. Almost all the newspapers in North America carried some or all of the letters during the winter and spring of 1768. After publication completed, printers published the series as a pamphlet, distributed in both America and England. Although published anonymously, everyone soon discovered that the author was John Dickinson. Since Dickinson went on to be a part of many things in the Revolution, I’ll give a little background on him now. Dickinson was born in Maryland to a prominent lawyer. When he was a boy, his family moved to Delaware. Dickinson left to study law in London for several years, making him one of the most well educated lawyers in North America. He started a practice in Philadelphia, and served in the Pennsylvania Assembly. At the time, many considered Delaware to be part of Pennsylvania, only with an independent legislature. Several politicians served in both the Delaware and Pennsylvania assemblies, sometimes at the same time. Dickinson began his political career as an opponent of Benjamin Franklin. Dickinson supported the Penn family as proprietors of the colony, while Franklin sought to get a royal charter, thus dumping the Penn family from the government. As a result of this fight, Dickinson lost his seat in the 1764 elections. Not to worry though, because Dickinson also owned a plantation in Delaware, he also sat in the Delaware legislature at the same time. After losing his Pennsylvania election, he continued to serve in Delaware. A vocal opponent of the Stamp Act, Dickinson participated in the Stamp Act Congress in 1766 (see, Episode 23). Dickinson was primarily a lawyer and politician. He did own a rather large tobacco plantation in Delaware. But his letters claimed that he owned a small farm in Pennsylvania. He deliberately mislead readers about his background. I guess Letters from a Philadelphia Lawyer sounded less quaint than Letters from a Pennsylvania Farmer. Most of the framers who published articles seemed to be ok with hiding or outright lying about who they were. We should not only pick on Dickinson for this. Dickinson’s first letter attacks the New York Restraining Act. The Letter itself is couched in relatively moderate terms about the need to respect our troops and that it is commendable for colonies to provide them with things. However, he then goes on to say that Parliament should not be able to compel a colony to contribute against its will. That is essentially the same as levying an internal tax. Forcing people to spend money when they do not want to do so is essentially the same as taxing them and then spending that tax money for that purpose. He notes that if Parliament can suspend the New York legislature for whatever it likes, it could use that same power against any colony. He calls on all the colonies to unite against this action. He also calls on Parliament to repeal the Act, even though it was already effectively dead letter since New York had already come up with the required money. In his second letter, Dickinson takes aim at the Revenue Act. He concedes that Parliament has long held the authority to collect duties as part of its regulation of trade. Yet the current act is far different from any before it. The new law is explicitly for the purpose of raising revenue, and not for controlling trade in any way. For this reason, he argues that it is just as obnoxious as the Stamp Act. He goes on to address the argument that people could refuse to pay the duties simply by not purchasing those items from Britain. But many of the items taxed are not made in the colonies. Further, Parliament has the power to forbid production of certain goods in the colonies. That power makes it impossible to avoid payment of duties in some circumstances. Therefore, a tax on imports for the sole purpose of raising revenue, rather than regulating trade, is unconstitutional. Dickinson’s third letter addresses the concern that Great Britain is too powerful to challenge. He points out that they just successfully challenged Britain over the Stamp Act. If an injustice is allowed to stand, the burden will only become greater and more difficult to change at a later time. That is why impositions on our liberty need to be nipped in the bud at the very start. He praises the King and the government as wonderful institutions and notes that America could never have thrived independently from them. Any attacks on colonial liberties are the results of mistakes or temporary passions that can be overcome. He urges calm and deliberate resistance to such measures. At the same time, the colonies must resist or things will get worse. The first step starts with petitions to make the government aware of colonial concerns and give them an opportunity to change. If that does not work, they must cut back on trade and make Britain feel the economic pain of colonial resistance. Surely, if we do this in a calm and united way, those good folks in London will see the error of their ways and institute proper reforms. The fourth letter attempts to expand on the difference between internal and external taxes. He notes that external taxes in the form of customs duties for the purpose of regulating trade are reasonable because the main purpose is regulating trade within the Empire. Tariffs for the sole purpose of raising revenue, and giving colonists no choice on whether or not to pay, is just as wrong as a direct internal tax like the Stamp Tax. The fifth letter looks at the history of Britain’s relationship with the colonies, noting that before the Stamp Act, Britain never attempted to create a law for the purpose of extracting revenue from the colonies. He stresses that the purpose of colonies anywhere is to strengthen and enrich the mother country. It is appropriate for the Britain to pass laws that force the colonies to remain dependent. However, such laws must be limited to the regulation of trade. Britain could bar colonies from trading with foreign powers or their colonies. It could prevent colonies from engaging in certain types of manufacturing or other industry. It could even restrict trade within the Empire. In doing all this, Britain had created a successful trading system that benefited the home country greatly. It already had a financial benefit from the colonies without the power of direct taxation. The overreach of direct taxation, therefore, only risked harming this beneficial system. Dickinson’s sixth letter tackles the issue of how to determine if a duty is collected for revenue or for trade regulation. He notes that this case is simple. The law explicitly says that its purpose is revenue. But what is to stop Parliament from passing a similar bill and simply claiming it is for trade regulation? It is, he argues, appropriate to look at the regulations themselves to see if they are designed to alter trading patterns or simply to extract money. If the latter, they are a violation of fundamental rights. Whatever the claimed purpose, a free people must remain vigilant as to the real purpose. They must resist any attempts at extracting revenue or they will slide into slavery. In his seventh letter, Dickinson takes on the concern that challenging these laws is an unpatriotic challenge to the King and his government. To this he suggests that, of course, the King and most of his leaders are good men who would support all of our freedoms. Sometimes though, designing men may try to sneak through destructive legislation. He even names the bad old former Prime Minister Grenville as part of the group that may have done this. Protesting is just the way of getting the attention of the good leaders to set things right. Next, he addresses the concern that the duties don’t even apply to most people since only importers pay the duty. The duties raise the prices that everyone pays for these items, meaning we pay the tax indirectly but don’t realize it. This is the way, he notes, tyrants like Roman emperors extracted exorbitant sums without the public noticing. Finally, he addresses the notion that these duties aren’t really that high, so what’s the big deal? To this, he points out that the taxes are starting out low to set a precedent. Once we’ve accepted that, later Parliaments can raise the prices through the roof. There is no principled argument objecting to the amount of taxes. Once we allow that these types of taxes are acceptable, there is no limit on how high they can go later. Letter number eight critiques the notion that colonies should be paying for their own defense. 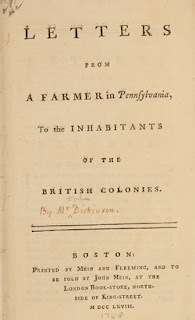 To this, Dickinson suggest that the defense of all the lands controlled by Britain in North America does not necessarily benefit the English colonies from New Hampshire to Georgia. These colonies are filled with good, loyal, and peaceful British subjects who don’t need any standing armies. The army is needed to control the dominions in Canada and the Floridas. That is where all the military spending is going. British occupation of those lands don’t really benefit the other colonies. In some ways they hurt it by distributing the population and hemming in colonial borders. Control of those dominions benefits the Empire more generally. Therefore, the Empire should bear the costs, not just the neighboring colonies. The tenth letter raised the concern that new tax money would increase the incentive to dump more expensive government positions in the colonies. Friends and family to people of influence in London were always looking for high paying government jobs. Lucrative military, civil, and religious positions would be foisted on the colonies paid for with ever-increasing taxes. To illustrate this problem, he points to Ireland, where England had filled the government with useless high paying government jobs, many of which came with generous pensions as well. The poor working people of Ireland were always straining to pay for these luxurious positions. Many salaries went to people who seemed to do nothing and often lived in England. It did not seem a stretch that the same pattern would come to America if the colonists did not resist at the outset. In his eleventh Letter, Dickinson returned to the notion that injustices start out small and innocuous only to grow over time. He pointed to the historic example of the King who started the use of a standing army with only 50 men. Over the generations, it slowly grew into an army of thousands. Similarly, excise taxes in Britain started off as minuscule but grew more burdensome over time. He conceded that the British paid higher taxes that the colonists did under these laws. That only showed that there was a near certainty that if these lower amounts were accepted that they would at least grow to the more burdensome levels paid in England. The twelfth and final letter urged everyone in the colonies to stand firm and united against even minor encroachments. It might be hard to work up the energy to fight a tax that did not affect an individual directly. But unless everyone remained vigilant and worked together against such measures, those in London would divide and conquer. They would go after small groups to vanquish them. Once complete, they would go after others who had stood by while the first group went down to defeat. Dickinson was not the only writer rallying colonial opinion against the Townshend Acts, but his efforts did seem to be the most influential and widely read articles on the topic. Even before he published the last letter in February 1768, colonial leaders began to step up and take action. 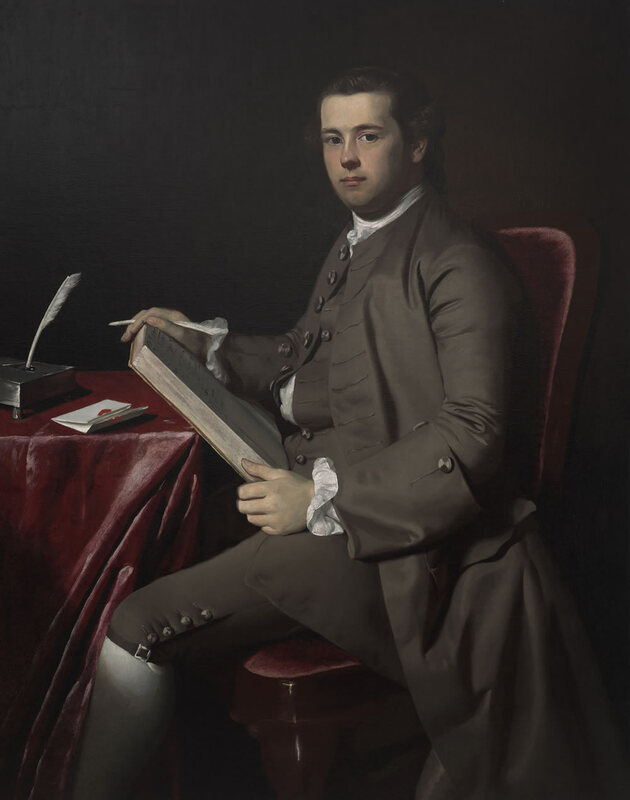 In December, following a Boston newspaper’s publication of the first two letters, James Otis presided over a town meeting that instructed the House to draft a petition calling for repeal of the Acts which violated their sacred rights. In February, the Massachusetts Assembly sent out a circular letter to all the colonial assemblies. The letter was actually pretty tame and respectful, but argued that any duties for the purpose of raising revenues violated their constitutional rights. By April, Virginia produced similar petitions. Other colonies soon followed suit. Dickinson seems to have inspired everyone to begin a coordinated attack. The new Secretary of State for Colonial Affairs Hillsborough reacted immediately. In his view, the colonies just needed a firm hand to put an end to this nonsense. 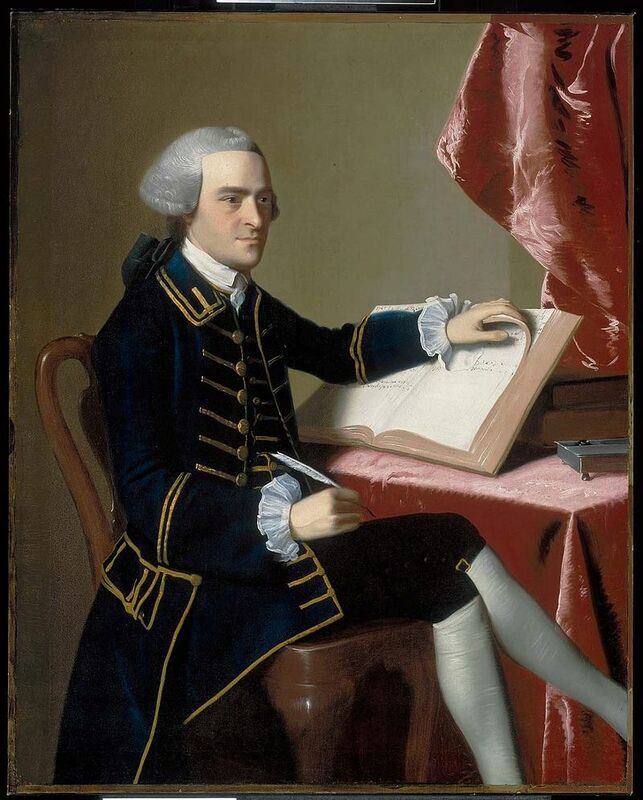 In April, he sent a circular letter of his own to the colonial governors, calling the Massachusetts letter an “attempt to disturb the public peace.” He demanded that the governors prevent their legislatures from acting on these letters. If they persisted, he instructed the governors to suspend the legislative session. He also instructed Massachusetts Gov. Bernard to have his legislature rescind the initial letter. Upon receipt of his letters, all the colonies meekly complied and the matter was over quickly. Just kidding of course! Hillsborough’s attempt to shut down the debate with force was exactly the wrong way to go. It only angered the colonists further. The Massachusetts House overwhelmingly rejected the order to rescind their protest letter. Gov. Bernard disbanded the House for the rest of the year. In the next elections the few members who voted to comply with Hillsborough mostly lost their seats. Voters replaced them with representatives with sturdier backbones. Before Hillsborough’s letters even arrived in the colonies, Massachusetts, Virginia, New Jersey, and Connecticut had already approved protest petitions. After receiving Hillsborough’s instructions, legislatures in Maryland, Rhode Island, Pennsylvania, Delaware, New Jersey, South Carolina, North Carolina, and Georgia ignored Hillsborough and approved their own petitions. Virginia even doubled down, passing another resolution condemning Hillsborough’s attempt to prevent them from coordinating petitions with other colonies. Only New York, still reeling from its spanking over the Quartering Act, had failed to act. By December, 1768 though, even New York joined its 12 neighbors in supporting a petition for repeal of the Townshend Acts. At the same time the legislatures were protesting, citizens began taking their own actions. In August, Boston merchants agreed to stop importing all goods subject to Townshend duties until Parliament repealed them. They further agreed to cease all import of anything from Britain, except for a very small list of necessities, for all of 1769. Salem, Massachusetts and New York City soon followed with similar non-importation agreements of their own. Philadelphia signed a temporary agreement in February, hoping for word that Britain would blink and back down. When they did not, Philadelphia merchants agreed to their own permanent non-importation agreement in April 1769. Other cities followed suit with similar agreements over the next few months. The Southern colonies were slower to react. In the spring of 1769 George Washington and George Mason were still corresponding about how best to get Virginia to adopt a non-importation agreement. The House of Burgesses attempted to take up the matter in May, only to have the Royal Governor summarily end the session before they could act. The representatives adjourned to a nearby tavern where they signed the non-importation agreement as a private agreement. In July, Charleston South Carolina merchants hesitated to act, but finally developed a non-importation agreement signed by over 200 merchants. For a time, it looked like they would wait forever, but then they knew that it was now or never. After all, it was the summer of ‘69! By fall, North Carolina and Georgia adopted similar agreements. While there were no riots in the streets, the petitions and non-importation agreements began to take their effect. Many colonists seemed to hope that Pitt would return and straighten out his ministry. When Pitt finally resigned in October 1768, Colonists realized that Grafton’s ministry showed no signs of backing down. In fact, officials were moving toward more aggressive suppression even of peaceful protests to their laws. To add to the tension, another rumor started in 1769 that England was going to attempt to establish Anglican Bishops in America, a few of those lucrative useless positions that Dickinson warned would cost more tax dollars. Also, the Massachusetts Assembly, still annoyed with Hillsborough’s power plays against them, refused to provide funds under the Quartering Act for the small number of British troops quartered in their colony. Both sides seem bent on provoking the other into further action. Next Week: The seizure of a ship named Liberty sparks a riot in Boston. Bradford, Alden (ed) Speeches of the Governors of Massachusetts from 1765-1775: and the answers of the House of Representatives to the same; with their resolutions and addresses for that period and other public papers relating to the dispute between this country and Great Britain which led to the independence of the United States, Boston: Russell and Gardner, 1818. Scharf, J. Thomas History of Philadelphia, 1609-1884, Vol. 1, Philadelphia: LH Everts & Co. 1884. 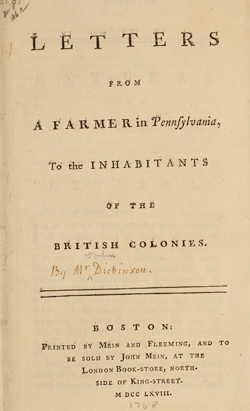 Stillé, Charles The life and times of John Dickinson, 1732-1808, Philadelphia: Historical Society of Pennsylvania 1891. Calvert, Jane E Quaker Constitutionalism and the Political Thought of John Dickinson, Cambridge: Cambridge University Press 2008. Last week, things started looking like they would go the right way for the colonies. Their hero, William Pitt, now Lord Chatham, had become Prime Minister. Pitt has always been one of the leading advocates in Parliament for colonial rights. He had spoken forcefully in favor of colonial freedoms and had been a tireless advocate for colonial rights throughout all the efforts to tax them. Before that, Pitt had been the man who got the colonies all that money during the French and Indian War, turning around all the problems they had, and getting the colonies to cooperate with the army in making Canada part of the British Empire. So when the Pitt administration passed the Townshend Acts, it looked like the colonies’ biggest advocate believed these new tariffs were reasonable. The colonists greeted the Townshend Acts with caution. They were not terribly happy about them, but also were not sufficiently outraged to march in the streets as they did with the Stamp Act. There were several reasons for this. First, as I’ve said, the Townshend duties were not internal taxes. Even though they were clearly designed to raise revenues, they met the demands of the Stamp Act protesters to keep clear of internal taxes. Import tariffs had been a part of colonial life for generations. Even though colonists had found a way to evade most of these tariffs, they had never made any sort of principled objection to Parliament’s authority to impose tariffs on the colonies. Second, most of the taxed items were luxuries. You did not have to pay the duties if you refused to buy the covered imports. The stamp tax had been required for the exercise fundamental rights, like a free press or access to the courts. You could not avoid that tax if you wanted to avail yourself of those rights. By contrast, the Townshend Acts were assessed mostly on imported luxury items. If you did not want to pay the tax, you could just do without those fancy imported goods. Third, the taxes were not that outrageous. The stamp tax was going to double the costs of some newspapers. That was big enough to put people out of business. By contrast the Townshend duties covered many more items, but only a small amount on each item. It was not going to make any particular item ridiculously expensive. Fourth, colonial elites were wary about encouraging mob violence on a regular basis. Even the most vocal opponents of the Stamp Act were concerned about encouraging the working class to march in streets and destroy the homes and property of those with whom they disagreed. That sort of thing could get out of hand really fast. Fifth, many feared pushing things too far with Britain. Colonists had seen British public opinion turn against them. They were clearly taxed less than British subjects. Even their traditional ally and advocate William Pitt seemed to be growing weary of their resistance. No one wanted to start a full on war with the home country. Sixth, the other colonies seemed to accept the new laws. 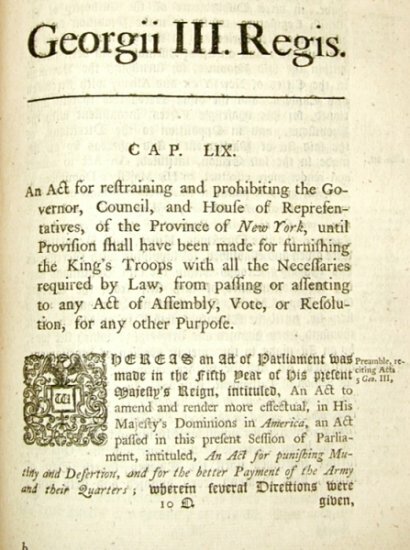 No one wanted to be like New York with the Quartering Act, being the only colony to resist. That would only result in Parliament focusing its wrath on them. As a result of all this, the colonies did not seem to have a powerful or coordinated objection to the new laws. They were simply unsure how to respond to them. 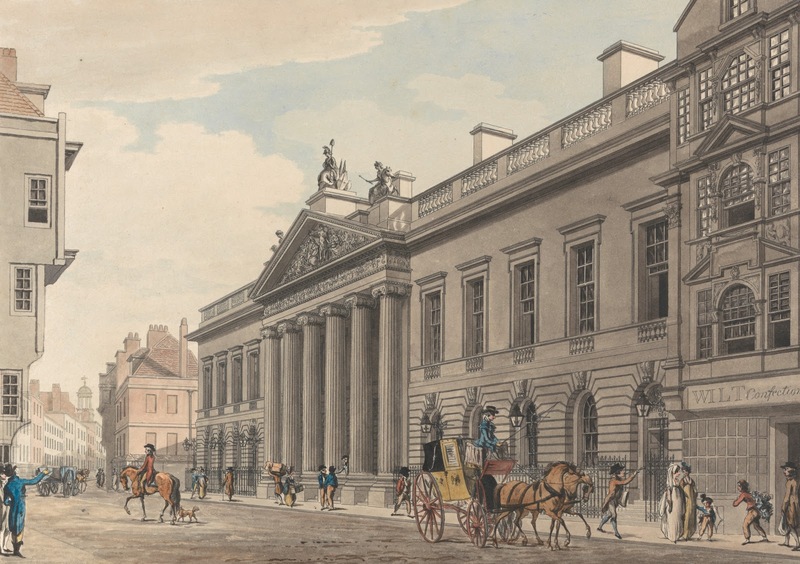 Even before the Townshend Acts took effect, the Pitt Ministry in London began to fall apart. 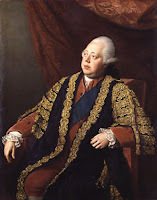 In July 1767, only about a month after passage of the Townshend Acts, Prime Minister Pitt suffered what has been described as a mental breakdown and withdrew from all public appearances. He was not well before this, but now seemed entirely withdrawn from politics. Although he would nominally remain Prime Minister, Pitt was gone from the scene. The role of prime minister unofficially fell to his first Lord of the Treasury, 31 year old Augustus Henry Fitzroy, 3rd duke of Grafton. That man, whom I will now just call Grafton, assumed the duties of prime minister in the summer of 1767, but would not become Prime Minister formally until Pitt resigned in October 1768. Grafton came from a family that held a prominent role in British aristocracy. He was descended from an illegitimate son of King Charles II. He came from a life of privilege. He went to the best schools in London. At age 12, he received designation as an earl when it became clear that he would eventually succeed to his Grandfather’s title as Duke of Grafton. Before becoming a duke, Grafton won a seat in the House of Commons at age 21. Since he served as representative of his family’s district, getting elected was only matter of getting his family’s approval. When his grandfather died a year later, Henry had to leave the House of Commons for the House of Lords. His father had died over a decade earlier, meaning that Henry became the third duke of Grafton on his grandfather’s death in 1757. Around the same time he began his career in the House of Commons, Grafton also got married. I only mention this because the marriage was not a particularly good fit. Although the couple had three children, Grafton had numerous open affairs. His wife decided to have her own affairs, and eventually go pregnant through one of them. This led to a divorce during Grafton’s tenure as Prime Minister. At the time, divorces were not easy and required an Act of Parliament. It was all a great scandal. In politics, Grafton associated himself with the radical whigs like Newcastle and Pitt. He even visited John Wilkes in prison after his arrest for sedition in 1763, though he refused to bail him out of jail. He made his first speech in the House of Lords that same year, opposing Prime Minister Bute’s treaty to end the Seven Years War. As a result, he incurred the wrath of the King, who took away his honorary title as Lord Lieutenant of Suffolk. A couple of years later though, Grafton joined the Privy Council as the Pitt faction gained more political influence. Next, he agreed to join the Rockingham ministry as Secretary of State. There, Grafton was one of the Pitt loyalists who undermined Rockingham’s leadership. Grafton supported Rockingham’s repeal of the Stamp Act, but resigned his position in early 1766, thus contributing to the instability of the Rockingham ministry, and Rockingham’s resignation as Prime Minister in July. 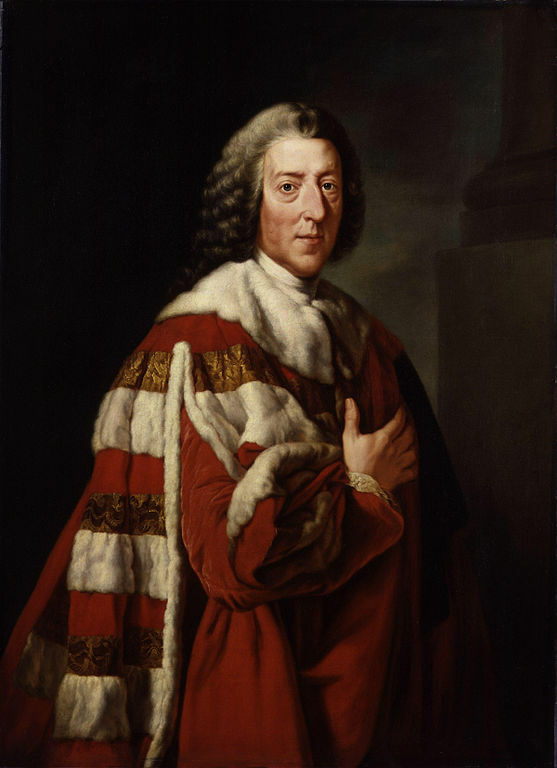 When Pitt established the new government, and became Prime Minister, Pitt took the job of Lord of the Privy Seal, rather than Lord of the Treasury. That was the traditional position for Prime Ministers. Instead, Pitt offered Treasury to Grafton, who was only 30 years old at the time. Grafton was not actually pushing for the job. In fact, he seemed reluctant to take on the role, thinking it above his abilities. However, he did take the job in the end. Grafton found himself in a tough situation. He generally agreed with Prime Minister Pitt’s policies. But Pitt did not seem to have control of his own ministry. When Charles Townshend proposed the Townshend Acts that I discussed last week, Grafton opposed them, but could not really openly fight the ministry in which he served. So by July 1767, after passage of the Townshend Acts, Grafton was unofficially acting Prime Minister, putting him in charge, but with the extent of his authority in question. Given also his youth, there was not good chance he would become a strong leader who could guide the ministry in a clear direction. In September 1767, the Ministry again experienced an abrupt change. Charles Townshend died rather suddenly from an illness. He was only 42 years old. Frederick North, took over for Townshend in the Exchequer. He also served as the ministry’s leader in the House of Commons. Since Lord North will go on to become Prime Minister for much of the later part of this story, it might be worth getting to know him a little more now. North, the son of an earl, was known as Lord North, even though he was technically without title for most of his life. 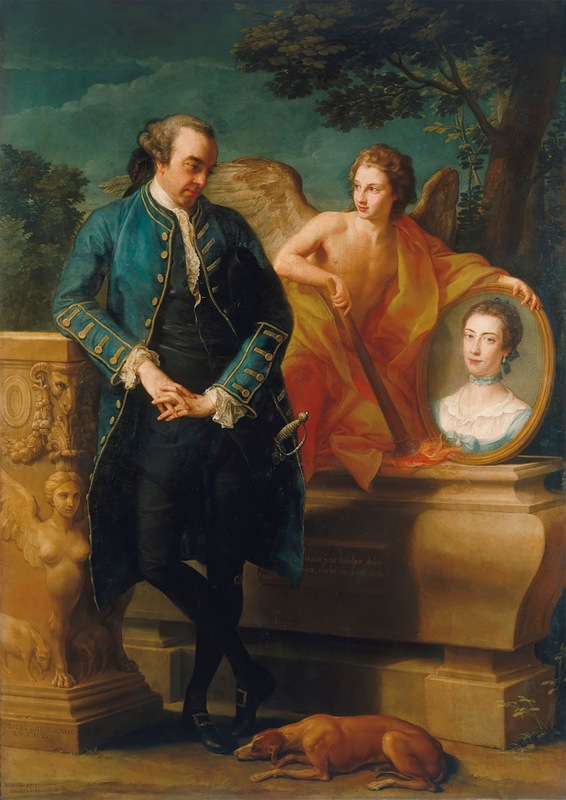 He would not obtain the title of Earl of Guildford until his father died in 1790. North lived the life of privilege available to wealthy aristocrats at the time. His mother died when he was only two. Shortly thereafter, his father married a widow whose son was also a baby and would soon inherit his grandfather’s title as the Earl of Dartmouth. North and Dartmouth grew up together as step-brothers, attending the best schools. In 1756 North won election to the House of Commons. After supporting the Newcastle ministry against an opposition attempt to mandate annual Parliamentary elections, North landed a position on the Board of Treasury. He continued in that role, even after Newcastle left office and through the Bute and Grenville ministries. When Rockingham came to power, he asked North to remain. North’s family, character, and financial abilities, as well as close ties to the King made him a valuable asset to each of these ministries. North, though, decided to resign when Rockingham came to power. When Pitt became Prime Minister a year later, North came back as Joint Paymaster-General. In December 1766 North received an appointment to the Privy Council. By early 1767, he began to attend Cabinet meetings. When Charles Townshend died suddenly in September, North’s background made him an ideal candidate to be the new Chancellor of the Exchequer. Although North considered himself a Whig, he was not an outspoken partisan, nor did he ally himself with the most radical factions of the Whig party. That was probably how he managed to remain working in the ministries of such widely divergent Prime Ministers. North was an establishment guy with friends across the political spectrum. He could be outspoken when he wanted to, but as a member of various ministries, he focused more on running government than on controversial policies. He had served as the voice of the Government during the 1763 attempt to prosecute John Wilkes for sedition. North led the effort to expel Wilkes from the House. He also voted for the Stamp Act in 1765. So as a moderate Whig with Tory leanings, North could get along well with both sides of the establishment. Most importantly, he earned the trust and respect of the King. Eager to get British debt under control, and not terribly obsessed with colonial sensibilities, North, fit well as a good replacement for Townshend. Another big change that took place at this time was a new division in how the ministry handled foreign affairs. At the time, there were two Secretaries of State. The Secretary of State for the Southern Department was responsible for relations with Southern Europe, that meant all the Catholic countries like France and Spain, that typically went to war with Britain. The Secretary for the Southern Department tended to be the more experienced and senior secretary. Newcastle, and Pitt, among others, had held this position in the past. The Secretary of State for the Northern Department dealt with Northern Europe, that is Britain’s traditional allies, including the Netherlands and the German States. Under this organizational structure, the Secretary of State for the Southern Department typically handled any issues related to the North American colonies. Typically most colonial issues would be resolved by the Privy Council. The Secretary of State would give the colonies little attention. Pitt was still technically Prime Minister in 1768, but his continuing illness left Grafton in charge. With the ministry growing more hostile to the colonies, the current Secretary of State for the Southern Department, was seen as too willing to make concessions with the colonies to keep the peace. Grafton wanted a firmer hand. Rather than replace his Secretary of State who was doing just fine handling southern Europe, Grafton decided to create a third Secretary of State, for Colonial Affairs. The colonies were going to need more attention. Having a secretary focused on just colonial affairs made sense. 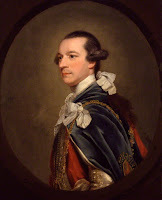 Grafton selected Wills Hill, the Earl of Hillsborough, to be his Secretary for Colonial Affairs. In his fifties, Hillsborough was appreciably older than many of the thirty-somethings in the ministry at the time. His family held a small estate in England, but held huge tracts of land in Ireland. Hillsborough was one of those absentee landlords that extracted a fortune from Ireland without spending much time there. Hillsborough had inherited his father’s lands and titles in 1741. About that same time, he was elected to the House of Commons. His title at the time did not entitle him to a seat in the House of Lords, but the lands under his control gave him control over about nine seats in the Commons. In the 1750’s he served on George the II’s Privy Council among other positions. In 1756, he received a Peerage and a seat in the House of Lords. Hillsborough tended to be more of a conservative, though he considered himself a Whig. He was good friends, and ideologically close to George Grenville. When Grenville became Prime Minister in 1763, he appointed Hillsborough to head the Board of Trade, overseeing enforcement of the Sugar Act and Stamp Act. Hillsborough left office when Rockingham replaced Grenville in 1765. Later in life, he claimed he opposed the Stamp Act, but there is no evidence from that time that he spoke out against it. In 1766, Pitt returned Hillsborough to his former position at the Board of Trade. About a year later, he replaced North as Joint Paymaster-General, a position that paid pretty well, but did not require very much work or policy making. 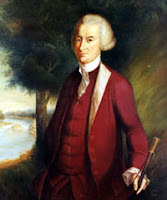 In early 1768, acting Prime Minister Grafton tapped Hillsborough to be his first Secretary of State for Colonial Affairs. It could be as a result of his upbringing, trying to control rebellious Irishmen on his lands, that Hillsborough thought that the uppity colonists needed a firm hand to keep them in line as well. Hillsborough would be much more confrontational and assertive with the colonies than most of his predecessors. We’ll get into that more later, but in hindsight, he was not the right man for the job at this point in time. Hillsborough was not someone who favored peaceful negotiations with the colonies. He came from the school of thought that held you operated from a position of power and forced your subjects to accept whatever policies you deemed appropriate. As Grafton began to reorganize the Pitt Ministry to his own liking, he continued to build on the tough policies created by the Townshend Acts. Some history books combine the Vice Admiralty Court Act in the list of laws that constitute the Townshend Acts. However, it really was separate. It was not even an act of Parliament. Rather, it was what we today would call a regulation, passed by Lords Commissioners of His Majesty's Treasury. Treasury created the regulation on July 8, 1768, more than a year after the other acts, and many months after Lord Townshend died in September 1767. Still, because it was part of the overall enforcement of trade and customs with North America, it gets lumped in with the other Townshend Acts. It was a continuation of the enforcement efforts set forth in the Townshend Acts that I discussed last week. The Act ensured that royal naval courts had jurisdiction over all matters involving customs and smuggling. Many of these cases were already being moved to the Admiralty Court in Halifax Canada. Colonists had complained about this, in part because getting witnesses and parties to Canada was a burdensome process. If there was a dispute in Charleston South Carolina, dragging everyone 1700 miles up to Halifax for a trial seemed a bit ridiculous. Still, the government was not going to turn over trials back to local juries. They knew the colonists would never enforce the new laws. Instead, the new Act created three new royal admiralty courts in Boston, Philadelphia, and Charleston. This allowed trials to take place closer to home, but also ensured many more of the cases would be tried in an admiralty court rather than local colonial courts. London ignored colonists’ other objections to trials in admiralty courts. The primary objection was the lack of juries. Colonists considered that a fundamental right, while London found that local juries simply ignored laws and allowed smugglers to go free. When officials in London passed laws which the colonies disliked, juror nullification, that is juries refusing to enforce such laws, was the only legal remedy that the colonies had. Colonist saw this as a protection for their rights. London saw it as an impediment to due process of the laws. Even without juries, local courts had locally appointed judges who were part of the community. 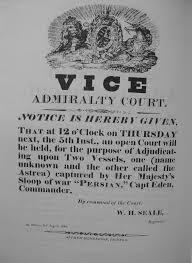 Admiralty judges were appointed in London. Even worse, judges received 5% of any award when finding someone guilty, an incentive the might make judges biased against defendants. Grafton expected this change would make customs enforcement speedier and more efficient. Creating these new courts would allow British customs officials to seize more ships used for smuggling and bring in more revenues. With Pitt out sick for most of 1767 and 1768, Grafton had slowly, perhaps even reluctantly, taken on the role of Prime Minister, even though Pitt retained the title. I’ve seen some arguments that Pitt’s illness was exaggerated, that he was mostly staying away from London because his popularity suffered after the “great commoner” accepted a title to become Lord Chatham. Others have argued that his isolation was more due to insanity than physical ailment. Whatever the real reason, Pitt remained out of touch with most of his own government for well over a year. During that time Grafton replaced many of Pitt’s appointees with his own, and began taking policy in a very different direction. Finally, in October 1768, Pitt decided he should not retain a position that he was no longer performing and tendered his resignation to the King. Grafton went from being acting Prime Minister, to actually Prime Minister. Pitt would continue his self-imposed isolation for another couple of years, finally returning to the House of Lords in 1770. Meanwhile Grafton would have to contend with enforcement of the Townshend Acts and other efforts to pay off British war debt. The colonies would not make this easy for him. Next Week: A Pennsylvania farmer writes some letters that finally galvanize colonial opposition to the Townshend Acts. Wilkes, John. A letter to His Grace the Duke of Grafton, on the present situation of public affairs. London: J. Almond. 1768.